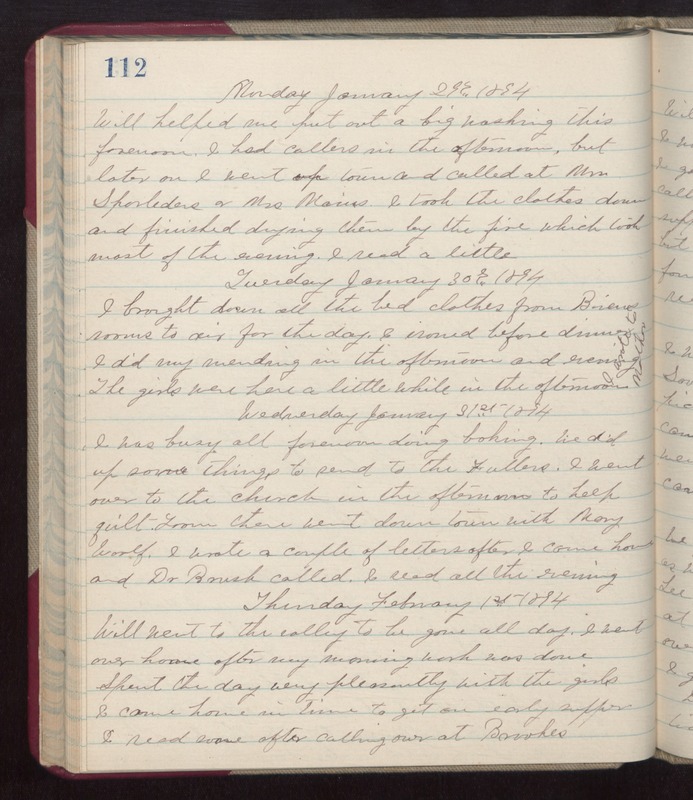 Monday January 29th 1894 Will helped me put out a big washing this forenoon. I had callers in the afternoon, but later on I went up town and called at Mrs Sporleders and Mrs Mains. I took the clothes down and finished during them by the fire which took most of the evening. I read a little. Tuesday January 30th 1893 I brought down all the bed clothes from Bivens rooms to air for the day. I ironed before dinner. I did my mending in the afternoon and evening. The girls were here a little while in the afternoon. I wrote to Mother Wednesday January 31st 1894 I was busy all forenoon doing baking. We did up some things to send to the Fullers. I went over to the church in the afternoon to help quilt. From there went down town with Mary Woolf. I wrote a couple of letters after I came home and Dr Brush called. I read all the evening. Thursday February 1st 1894 Will went to the valley to be gone all day. I went over home after my morning work was done. Spent the day very pleasantly with the girls. I came home in time to get an early supper. I read some after calling over at Brooks.